Back in June, after hanging out in the Coal Age Galapagos for a few days, I spent a bit of time at some old haunts elsewhere in Nova Scotia. The Bay of Fundy is a pretty great place because you only have to drive a little ways in any direction to have totally new rocks with different and exciting fossils. 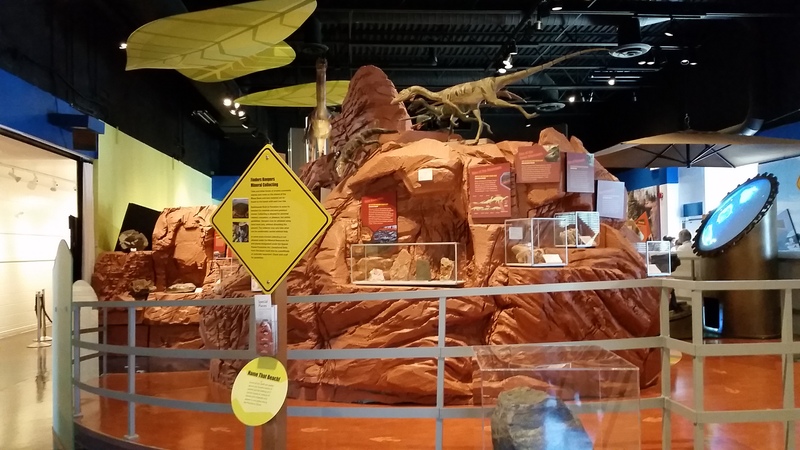 If you pass through Parrsboro, you’ll find the Fundy Geological Museum – the home base for my first dinosaur dig experience back in 2004, but with a fresh facelift since I last visited 10+ years ago. This chunk of the Bay of Fundy features Triassic and Jurassic sedimentary rocks, as well as massive flood basalts that erupted during the opening of the Atlantic Ocean. 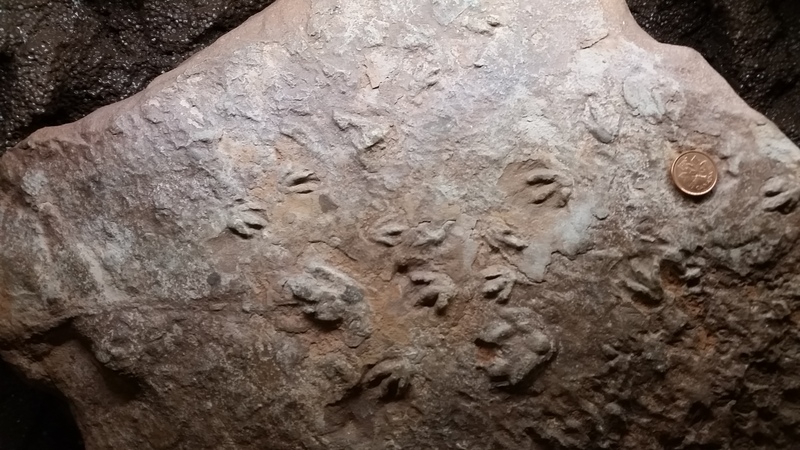 Although not as famous as their western counterparts, there are some real treasures from Nova Scotia, like the world’s smallest dinosaur trackways pictured here with Canadian penny for scale. 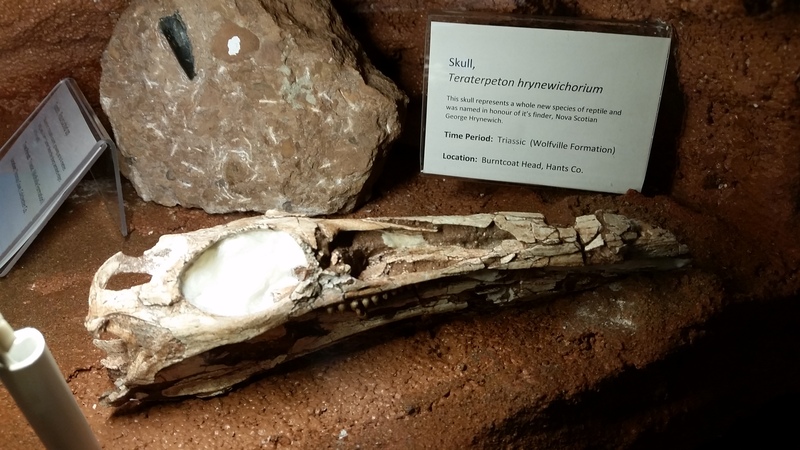 New for me was the absolutely stunning skull of Teraterpeton, an early-diverging archosauromorph closely related to Trilophosaurus. I love that long snout and those weird teeth. Let’s find the rest of this fellow! 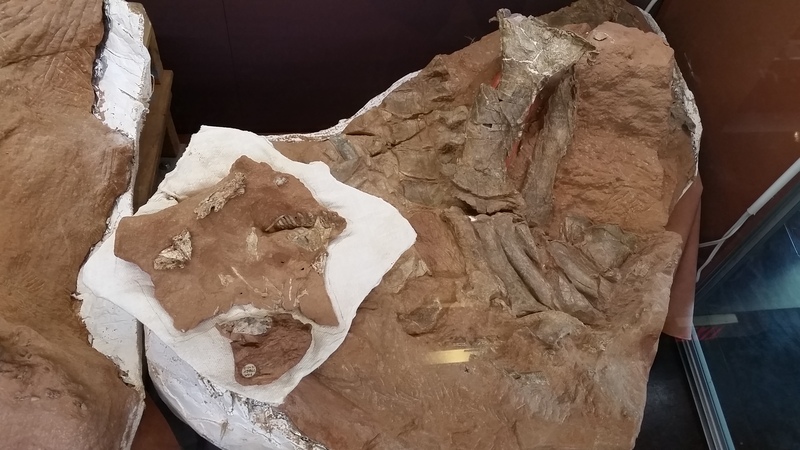 A smaller but no less significant discovery was this skull of Clevosaurus, a Triassic relative of today’s tuatara. But of course the big draw at any fossil museum are the dinosaurs, and the FGM has those, too, in the form of prosauropods. A mounted replica of Plateosaurus ambles across the gallery outside a window to the prep lab. 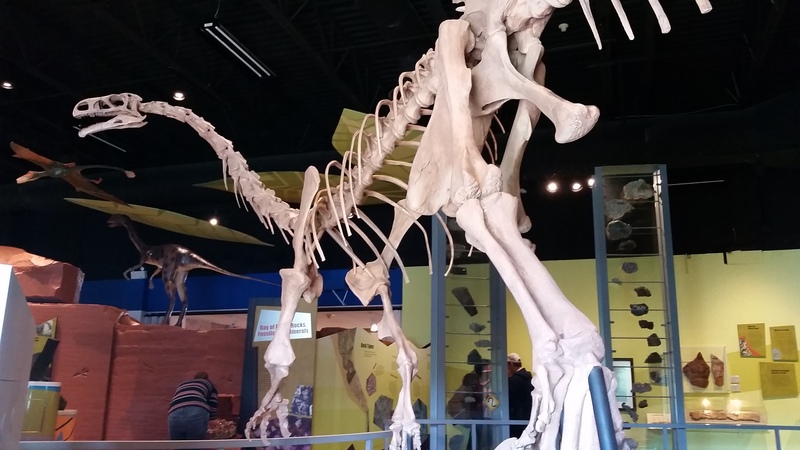 And original fossils of the prosauropods found just down the road from the museum at Wasson’s Bluff are on display, too. 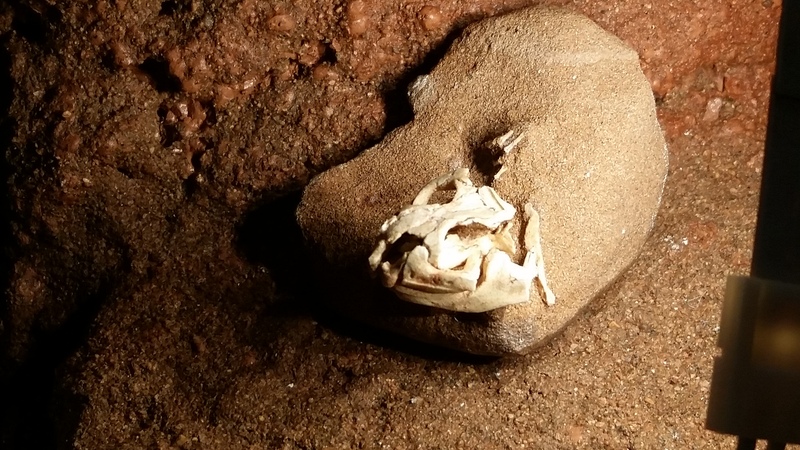 I helped excavate some of this material and it’s an interesting challenge compared to work I’ve done out west: the bones are incredibly soft, especially when wet, and micro-faults cut through the bones themselves sometimes, making it a bit hard to follow where your bones begin and end. This makes them a little harder to display and interpret, but quite a bit of very nice material has been collected from the site, and the Fundy tides reveal more fossils every year. 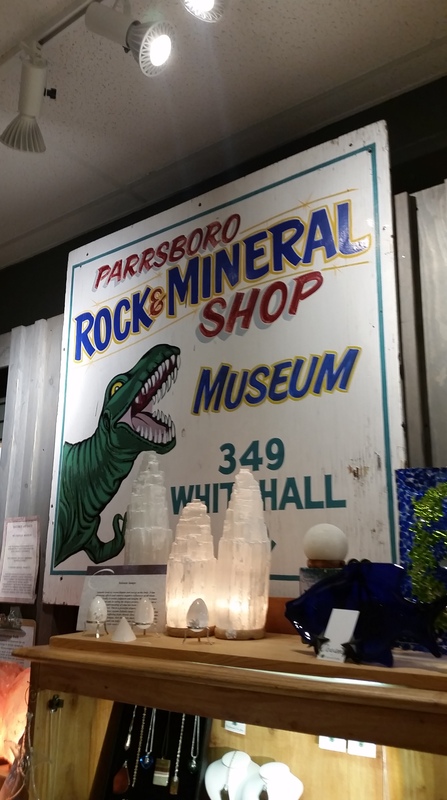 I’ve focused on fossils here because, well, I’m a palaeontologist, but it is a *geological* museum after all, and so there are many fine displays of Nova Scotian minerals. 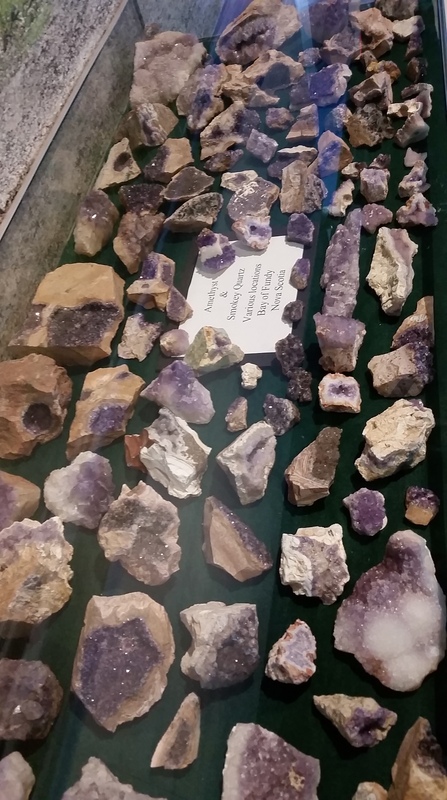 Our provincial fossil is the amethyst, and this display makes me incredibly jealous that I’ve never found any amethyst yet in my rockhounding adventures. 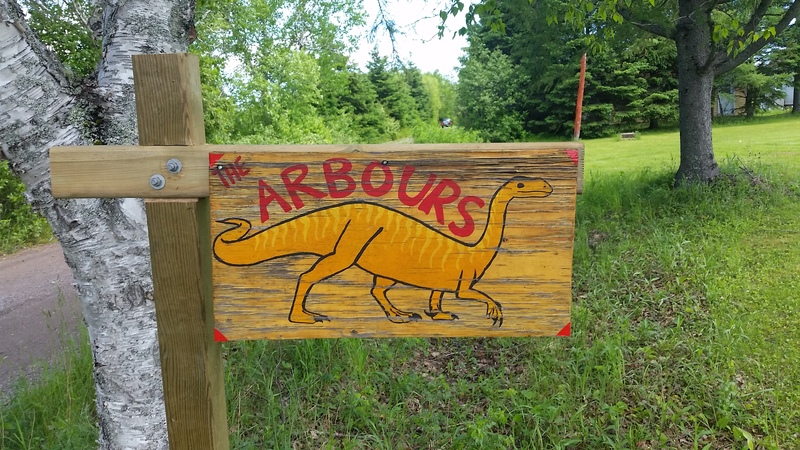 Visit the FGM gift shop and you’ll be treated both to the absolute best display of Rite in the Rain notebooks you’ll ever see, complete with water feature demonstrating their waterproofness, and this fixture of Parrsboro dinosauriana, the sign for Eldon George’s truly one-of-a-kind rock shop. Back on the other side of Nova Scotia, a mere hour away on the Northumberland Strait, the Arbour clan has a summer cottage. 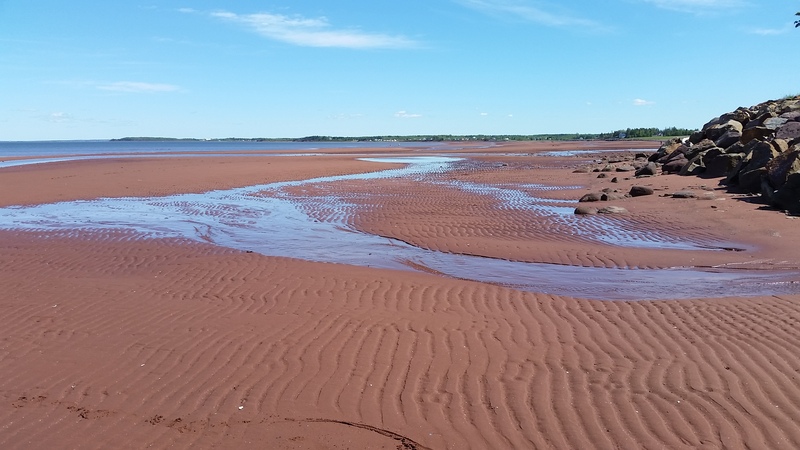 Although the red rocks and sand look similar to those around Parrsboro, and the tides here also go way way out at low tide, we’re actually hanging out in the Permian now. I haven’t spotted any fossils here yet, but bits and pieces have been found down the shore, and I think these rocks are continuous into PEI, the home of Bathygnathus (nee Dimetrodon). I may not have gotten out to Drumheller or Dinosaur Provincial Park until I was in grad school, and Nova Scotia may not be the first place people think of when they think about Canadian dinosaurs, but this corner of the province helped shape the imagination (and practical skills!) of this budding palaeontologist. It’s always nice to go back. Just stumbled across this post – wow! Fascinating museum. Glad they have a nice little display of our stuff in there. Fun to hear. Would love to hear about how RITR is useful in your field work! Maybe shoot me an email at jim@riteintherain.com if you’d like.